Oh, to be a fly on the wall in the offices (and personal homes) of the San Antonio Spurs right now. What must the Spurs — coach by coach, player by player, support staffer by support staffer — be thinking as they watch the Oklahoma City Thunder lay waste to the Golden State Warriors in the Western Conference Finals? What are the Spurs thinking? The question is delicious enough that it’s best to let it sink in with a pregnant pause. Back to the show. Before going any further, let this much be said about the larger topic of the Spurs in relationship to the NBA and the Western Conference’s elite: This is not a criticism of any in-season opinion of the Spurs as a team, be it positive or negative. If you were always a believer in this team, you had plenty of reason to express a high level of trust and confidence. If you held reservations about the Spurs in the NBA Playoffs, they were powerfully affirmed in the Western Conference semifinals against the Thunder. There’s no need to be critical of either side. People have opinions. Anyone in the business of punditry, anyone who is asked for predictions — print, online or broadcast — will get some calls right and some wrong. That’s not a reflection of job performance. Failing to spell correctly should get a columnist fired; plagiarism should cause a blogger to be fired. Being right or wrong about the 2016 Spurs should have no bearing on how anyone evaluates an analyst’s work. What’s worth (re-)examining in light of Oklahoma City’s surge, which has obviously recast the way in which the 2015-16 Spurs should be seen, is the specific way the end of San Antonio’s season was covered and perceived. I enjoyed the piece by Matt Yoder here at The Comeback on Kobe Bryant and Tim Duncan linked above. The column celebrated Kobe’s and Duncan’s achievements, acknowledging the fact that Duncan’s career is winding down. Given Kobe’s recent (and official) retirement, it is only natural to measure him against Duncan one more time. It’s a water-cooler conversation which will resurface on the day when Duncan actually does retire. Why mention this in a piece on the perception of the 2016 Spurs? Very simply, if you spent the night of Thursday, May 12 on #NBATwitter, during and after the Spurs’ Game 6 loss to the Thunder, you would have thought that Tim Duncan was washed up. 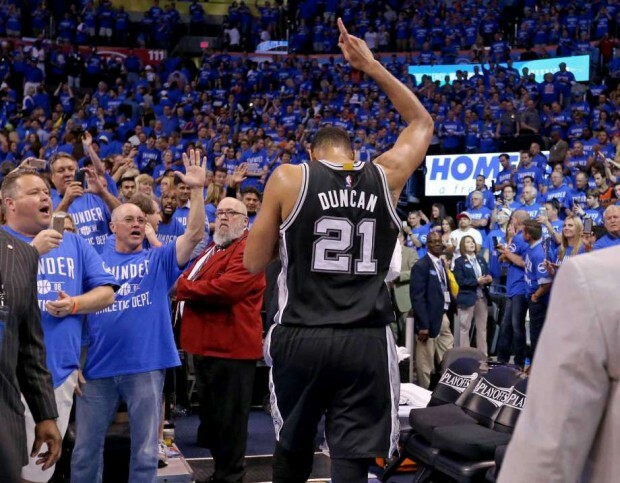 There’s no denying that Duncan struggled against Oklahoma City’s size, length and energy. His scoring and rebounding output in a playoff series dropped precipitously. Last year against the Los Angeles Clippers, Duncan was still… Duncan, playing at a high level more often than not. Is Duncan going to be as good as 2015 or better in any future NBA season? Very likely not. Moreover, no one is disputing that. However, saying Duncan is done as an impactful NBA player — a claim with enough weight to create a groundswell of opinion urging The Big Fundamental’s retirement — represents a big leap from merely acknowledging a player’s decline. This, in many ways, was and is the worst part of the large-scale media reaction to the Spurs’ exit at the hands of the Thunder. It wasn’t anything related to the 2016 Spurs and an evaluation of their quality or performance. It was the assessment of Duncan — during Game 6 versus OKC, but also in relationship to the viability of his future as an athlete — which represented knee-jerk commentary at its worst. When a large community of analysts — in any sport or, for that matter, any field of endeavor — pronounces a given performer as “past his prime,” or “finished,” or anything to that effect, the verdict’s scope and finality cement the idea in the public imagination that said performer has nothing more to contribute. Analysts, en masse, might not directly utter the word “retirement,” but they certainly suggest it when they say that a legendary athlete is finished. If you were on #NBATwitter May 12 when Oklahoma City eliminated the Spurs, you easily could have walked away with the impression that the large community of basketball commentators — while perhaps lamenting Duncan’s decline and genuinely sad to see No. 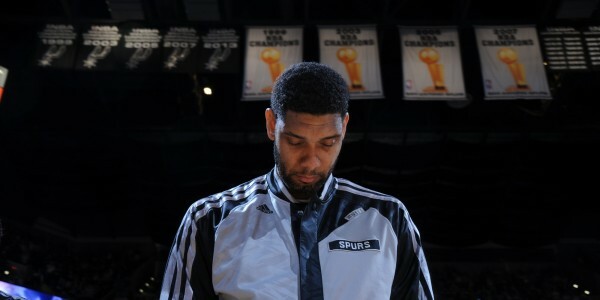 21 fail — felt The Big Fundamental had nothing left to offer the NBA as a player. The tidal waves of opinion which coursed through social media after Game 6 of Spurs-Thunder had the effect of suggesting that Tim Duncan’s career — in essence, if not officially — had ended. The greatest performers among us deserve the ability to end their careers on their own terms. This doesn’t mean one can’t argue Player X should or shouldn’t retire. If you made the case that Duncan needed to retire to free up money and achieve certain team-specific goals, that rates as a reasonable way to urge an exit for the greatest power forward the NBA has ever known. What’s not acceptable in terms of treating legendary athletes near the end of the line is to say — or suggest — that by not retiring, an athlete is staining his (or her) legacy. Saying that an athlete is finished certainly suggests that continuing to play will diminish that player’s career and its body of achievement. Using the F-word (“finished”) might not be tantamount to saying that an athlete is hurting his legacy, but it’s close enough that the line will be blurred for an appreciably large subgroup. That takes away autonomy from the athlete — not in terms of actual freedom, but in terms of attaching a label and its judgmental components to the athlete if s/he chooses to continue playing. Here’s the more specific reason Oklahoma City’s demolition of Golden State — by making the Spurs look good — is such an important development: More than anything else, it has given Tim Duncan his autonomy back. Let’s acknowledge this point about the final stages of an iconic athlete’s career: There will come a time when that athlete does reach a point of no return (unless he goes out on top, as Michael Jordan almost did in 1998, and as Pete Sampras did in 2002 at the U.S. Open). What’s fair to the declining athlete, however, is to at least see if a single season does or doesn’t represent a true indicator of where that athlete stands. In other words, if a legendary athlete suffers one noticeably poor season, the larger community of sports analysts should (emotionally, spatially) allow that athlete to play another season. Only then, during or after that follow-up season (if performance has clearly not improved), does a call for retirement become reasonable. If it comes before that “follow-up season,” it has the appearance of wanting to rush an athlete off the stage, depriving him of the aforementioned autonomy he deserves. We arrive at the heart of the matter, then, with Duncan and the Spurs: No. 21 played well in the 2015 playoffs, after playing well in the 2014 playoffs, the 2013 playoffs, the 2012 playoffs, and basically the entirety of his pre-2016 career. Because he looked old and slow in ONE playoff series, a large cross-section of NBA commentators felt Tim Duncan was done? Because of ONE series against a team which — as we can plainly see against Golden State — is playing transcendent defense and making a 73-9 team look slow and soft, a lot of generally smart people lent a funereal quality to Game 6 of Spurs-Thunder? It was disappointing to read. It was frustrating and irritating to see normally thoughtful people dismiss a player who formed a part of a 67-15 NBA team, a team with the best regular season record the Spurs have ever forged. The more one thinks about the way Tim Duncan was described on the night of May 12, 2016, the more one realizes how much his simple presence in the Spurs’ locker room, and on the Spurs’ bench, and within the organization itself, was disregarded. 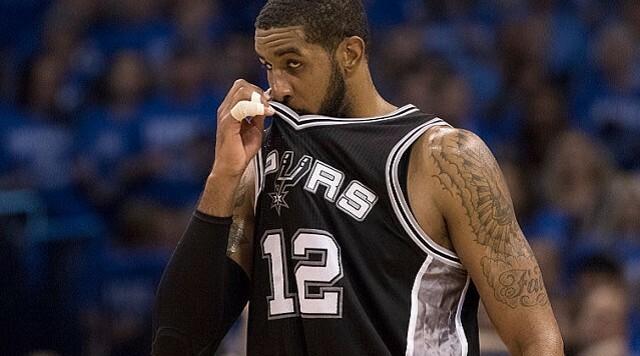 No player of Tim Duncan’s caliber should be intellectually and contextually kicked to the curb in such fashion — not under this basket of circumstances; not at the end of a 67-win season; not at the end of a series in which Oklahoma City grew up and simply outplayed San Antonio, giving us all a taste of what lay ahead against the defending champion, 73-win Warriors. 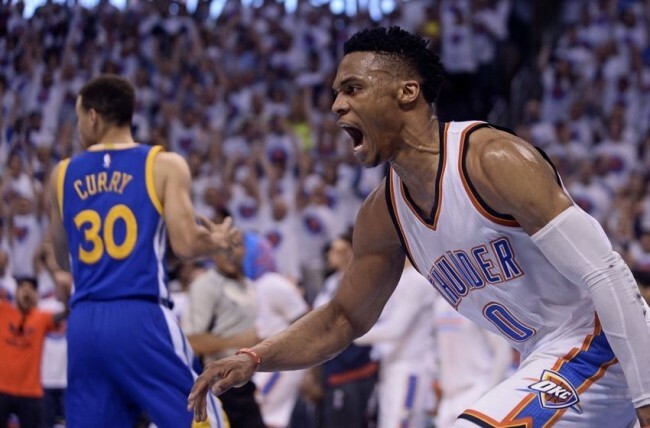 Yet OKC has indeed thumped the Warriors through four games, entering Game 5 on Thursday in Oakland. The Spurs — who were much more competitive than the Warriors have been against the Thunder — might feel a little bit better in the short term. What really matters, though, is that the idea of Tim Duncan being finished as an NBA player contains a lot less weight than it did for many people on May 12. The Spurs aren’t done. On a more powerful emotional level, Tim Duncan isn’t finished. Let’s see where we are a year from now instead of rushing to proclaim this franchise and its iconic big man as old wineskins containing absolutely no hope for the future. The Oklahoma City Thunder have, most ironically, given Tim Duncan renewed reason to think he can still make a meaningful contribution as an NBA player. He always deserved that chance from commentators, but now, he’ll probably get that chance no matter what anyone else thinks.